Three of the biggest software developers for online casinos come together at LuckLand to create a collection packed with big titles. The operator adds top bonuses and promotions into the mix while focusing on the Australian market. The first impression of LuckLand Casino is a very good one. It is always nice to see the big developers available on the same site and there aren’t many combinations which are better than Microgaming, Betsoft Gaming and Net Entertainment. However, players should know right off the gate that these developers do not list their full collections at LuckLand Casino and instead only present their biggest games. As a result, the pokies category has more than 120 of the biggest online slots on the internet, including jackpots that can award more than one million Australian Dollars. Moving a bit away from the games and on to the promotions and we find that LuckLand Online Casino is offering a welcome package that can go up to $1,000 across the first three deposits made within 48 hours. More bonuses will follow every week so that customers can really have fun with the provided games. Also, the services for banking and support are nicely done for the best assistance. The welcome package does come with a clock on it once the first deposit is made. This alone is enough to land a 100% bonus for up to $400 but if you want to claim the other two bonuses you have to make an additional two payments within 48 hours. The second deposit bonus is of 50% up to $200 and the third offer goes up to 150% for a maximum of $400 for free. LuckLand offers weekly reload bonuses based on the size of the deposit, cashback every week and surprise offers. The variety of games that comes with the three providers has been limited by only selecting some of the options but the list of about 200 titles is still awesome. The software doesn’t require a download and so gamblers can enjoy their preferred games and categories right from the site. With the modern software, it is no surprise that LuckLand has a great mobile casino. Much like the desktop version, there is no application that has to be downloaded and installed before playing the games. The site keeps its colour scheme but shows fewer details, while listing the collection right away in several categories. More than 50 pokies make for a good sample of what the casino has to offer, especially when the big titles are the ones that have been optimized for smartphones and for tablets. It doesn’t matter if you have an iPhone, a Samsung Galaxy, a Nokia Lumia, a Blackberry or another smartphone when it comes to playing at the mobile casino. The recommended web browser is Google's Chrome but other apps work just as well. And speaking of working well, the graphics look amazing on the modern touchscreens and the controls can appear a bit different from the standard version to better accommodate the size. Most of the progressive jackpots are available on LuckLand Mobile and this means that players can stand to win life-changing sums by swiping the reels. Mega Moolah is the perfect example here. To complete the list we found a few card games and roulette when playing from iOS and Android mobile devices. Crossplay: Yes, the platform is the same so the account can be the same as well. The mobile website maintains all of the payment options for Australian players and the bonus remains the same as well. $1,000 is waiting for new customers who register today and the other promotions will apply. No time wasted with downloading apps and no compatibility restrictions to worry about make it very easy to start at the mobile casino. Get your Android smartphone or your iPhone and go to the site from the browser. Quick Tip: Just because you don’t have an app icon, doesn’t mean that you can't have the casino just a tap away on your smartphone. Simply add it to the home screen and you are set. English is the main language but since the casino online is available in other countries than Australia, the site also shows options for French, Spanish, Finnish, Norwegian and Swedish. The selection can be made from the right corner on the top banner. If assistance is needed at any time, the LuckLand Casino customer support team will happily help out by live chat, email and telephone 24 hours a day, 7 days a week. LuckLand Australian Casino is secure and all of the games are fair. Pokies come with a variety of themes and high-end graphics to better tell immersive stories with every spin. There are tournaments for selected games that can award a lot of money in bonuses to the top players and there is a VIP program to reward loyal customers. Four levels are provided for the reward program and benefits can include special bonuses, faster withdrawal processing times, bigger limits, exclusive gifts and more. It pays to be active and when there are so many top online slots to try out, it is very easy to win and have fun at the same time. Another thing we would like to cover in the online casino review is the withdrawal process. The options available are Skrill, NETELLER, EcoPayz and bank wire transfer in Australia and these can be used from the mobile casino as well. The standard processing timeframe is of four days. 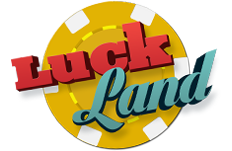 LuckLand Casino doesn’t have as many games as seen on other websites but at the end of the day, it doesn’t really have to. Quality is much more important than quantity and it is clear that the operator understands this very well with its modern platform that has big name pokies. Betsoft, Microgaming and NetEnt have plenty of options when it comes to famous slot machines and this alone should be reason enough to join. However, as we talked earlier, the good parts of the casino don't stop there and the promotions stand out with a $1,000 welcome package and other offers after that. Banking is a bit limited but nothing to cause problems and the support team will be very friendly when answering questions. Play at LuckLand Casino with your $400 Bonus Now!